Inspired by the geniuses Nikola Tesla and Albert Einstein, teenager Max Loughan loves to invent things, in fact, he says he has known his entire short life that his purpose was to change the world with his inventions. And he may just do it. Wearing a lab coat while speaking in a televised interview with KTVN Channel 2 in Reno and Tahoe, Nevada, Max explains the free energy device that he made in his parents’ boiler room turned laboratory. A massive Soviet-built generator – once used for testing the resistance of aircraft to lightning, but now largely mothballed due to prohibitive costs – has staged a striking demonstration test at the behest of RT. 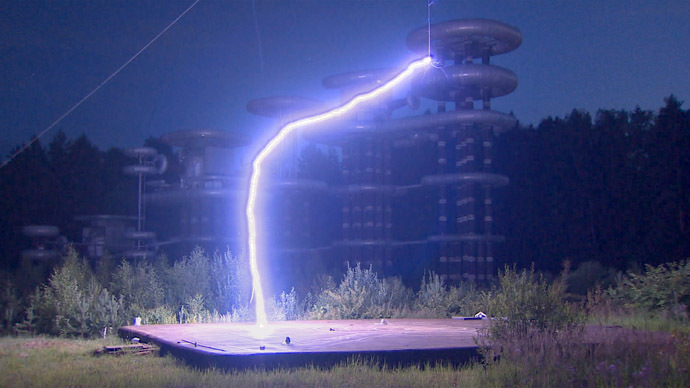 The 6-Megavolt device, one of the most powerful in the world, is capable of generating 200 meter-long lightning bolts, and was constructed in the 1970s at a closed facility outside Moscow, but fell into disuse after the collapse of the USSR. The futuristic complex of entangled metal coils hidden in a secured virgin forest made it a cult object for urban explorers. Teams of camera-equipped youths navigated their way and documented the rusting coils and huge locks on their blogs. I am sure the elitists have the technology to clean this mess up. And yes, a high-powered energy/frequency generator would be the way to do it. VANCOUVER, BC – In an ExopoliticsTV interview with Alfred Lambremont Webre, independent scientist Leuren Moret, MA, PhD ABD, detailed how the Fukushima site have now, through the Wigner effect, become breeder reactors, furthering an intentional global depopulation and extermination of the human (and animal species) population. Ms. Moret reveals how the HAARP Tesla technology can be used to reverse the radiation now present in the Earth’s atmospheric column, its oceans and land masses, and terminate the intentional extermination program. Achieving control of the HAARP technology to reverse global radiation would involve either (1) persuading the controllers of HAARP to reverse their decision to exterminate or depopulated the human species, or (2) the awakening of the world population to secure control of HAARP and direct its Tesla technology to be used beneficially to reverse global radiation. Scholars have told us that the first civilisation on Earth emerged in a land called Sumer some 6000 years ago. The persistent research by South Africans Michael Tellinger, Johan Heine and a team of leading scientists, over an extend seven-year period, has resulted in astonishing new archaeological and scientific discoveries. It shows that the Sumerians and even the Egyptians inherited all their knowledge from an earlier advanced civilisation that lived at the southern tip of Africa more than 200,000 years ago… mining gold. I have always wanted to test a radiant energy motor. This little motor is the beginning of my research in that direction. In the near future I will be making larger more powerful motors. The precision required will probably require my 3D printer. Stay tuned for future updates. Video correction: The 2000+ watt device was built by Jules Guillot. The United States Army’s team of scientists are busy at work developing a device that will shoot lightning bolts down laser beams to destroy its target. The Laser-Induced Plasma Channel, or LIPC, is designed to take out targets that conduct electricity better than the air or ground that surrounds them. The idea is for a laser beam to be sent in the direction of the target.